We are trying some big changes for Northern Spark 2018. Read on for more information about locations, dates (plural! ), and this year’s theme. Find the Northern Spark 2018 website here. Nicollet between 4th St. and 8th St.
We are experimenting with this new structure primarily to ensure that the effort artists put into their projects is not washed out by increasingly volatile weather. Unless otherwise stated, all projects must take place in full on both nights. Northern Lights.mn will provide overnight security for installations, but valuable parts of any installation should be removable or securely mounted. 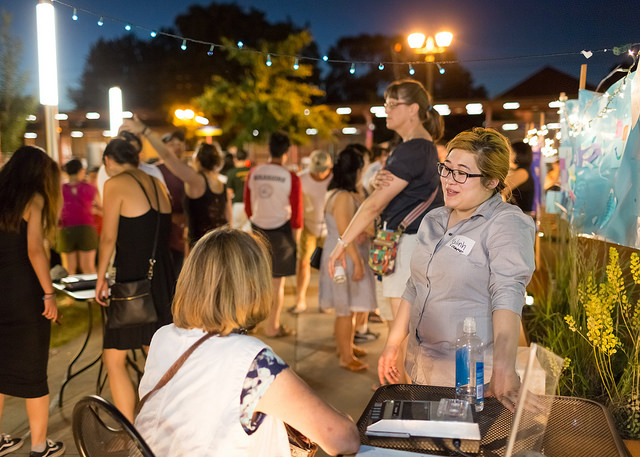 The 2018 theme of commonality takes its cue from its venues: The Commons, the Minneapolis Central Library and Nicollet Mall. What is a 21st century commons? A 21st century library that serves everyone? A pedestrian friendly avenue that is friendly to anyone? At a time when the darkest parts of our collective identity surface daily in public forms — overt racism, no-big-deal sexism, challenges to our rights to free speech, policies that fly in the face of climate science — we at Northern Lights.mn are committed to providing platforms that resist these ideas, that open dialogue and create relationships. What do we have in common? More specifically in the context of Northern Spark, what do we share when we gather together in physical space? We recognize this is a difficult and maybe even dangerous question. Too many times, appeals to the “common good” are just calls to support the established order gussied up as unquestioning patriotism. Don’t kneel because it disrespects. All Lives Matter. Don’t rock the boat. Is it possible to share common ideals and goals while acknowledging significant differences in heritage, lifestyle, income and interest? What do we have in common in a city with significant racial disparities in employment, education and other markers of well-being? Can there ever be common ground on land that was colonized? And what do these questions mean for Downtown Minneapolis – one neighborhood in the midst of many in our metropolis? We invite you, the creative sector, to explore through installation and programming how artists and their art can help activate The Commons, Minneapolis Central Library and Nicollet Mall as sites of commonality.